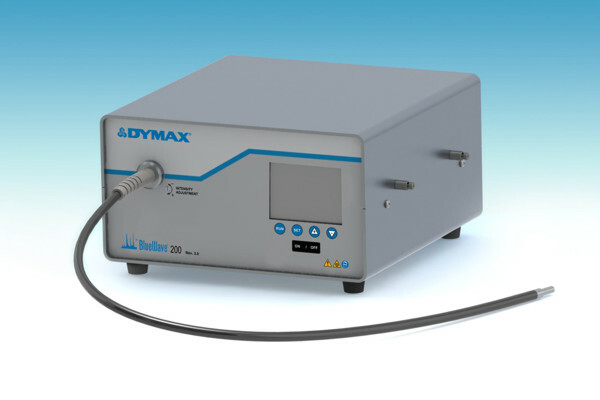 A new iteration of the DYMAX BlueWave® 200 high intensity spot curing system was announced recently by their Sales Partner Intertronics. This enhanced UV spot curing lamp is versatile, user friendly and reliable – and consequently of interest for UVA/visible light cure of adhesives, coatings and encapsulants in the electronics, medical device, opto-electronics and technology manufacturing industries. The team at Intertronics point out that this sleeker design has an improved operator interface and smooth control panel which features an easy to wipe membrane for clean room applications. Building on the more than 17000 mW/cm2 light intensity (at 300-450nm), DYMAX have added an automatic power-on sequence which ensures full light output before the unit can be used, so preventing partial cures in early throughput. The BlueWave® 200 3.0 is fully capable for either manual or automatic processes. It contains an integral shutter which can be actuated by a foot pedal, from the front panel, or from PLC/automation, and a universal power input that provides consistent performance at any voltage. Importantly the unit features a patented intensity adjustment control. This is important for validating an appropriate intensity range and maintaining that range during production by means of a simple faceplate adjustment in conjunction with a calibrated radiometer. This enables scheduled light intensity correction to be made throughout the anticipated 2000 hour useful bulb life, so ensuring optimum output at all times. Measurements of light intensity can be taken through the light guide in-situ on the production bench. Standard liquid filled light guides are offered in single, double, triple and four pole options, with quartz fibre versions also available.The combination of these features is expected to ensure simple, reliable operation with maximum yields and quality levels.